In the sequel to the 2013 heist thriller hit, a good percentage of the Horsemen resurface for a comeback performance only to be threatened into pulling off a dangerous heist by tech prodigy Walter Mabry (Daniel Radcliffe). Their only hope is to perform one last stunt to clear their names and reveal the mastermind behind it all. Now You See Me 2 sacrifices everything that made the first movie successful and entertaining to bring you a bloated, unimpressive, and ridiculous mess of a sequel. Jon M. Chu (director of G.I. Joe: Retaliation and other bad films) was one of the worst choices to direct this film. He turns the franchise from a heist chase thriller into an action caper, which really does not suit the films. The first movie’s original taste and fun is gone here. Jesse Eisenberg, Woody Harrelson, and Dave Franco are not as good as they were in the first film, although Mark Ruffalo still delivers almost as well. Replacing fourth Horseman Isla Fisher is Lizzy Caplan, who is surprisingly entertaining and without a doubt, the most fun part of the movie. However, none of the actors besides Caplan seem like they’re having fun with the film, even Ruffalo doesn’t feel like he’s always enjoying being there, even though he gives it his all. Daniel Radcliffe’s onscreen presence here was awful, with his character having an unclear motive and barely any point in the film. Michael Caine was also very dull, and Morgan Freeman’s return was way too unnecessary. The movie’s plot is not focused well, and is badly shot and edited, with every shot not feeling continuously edited well. 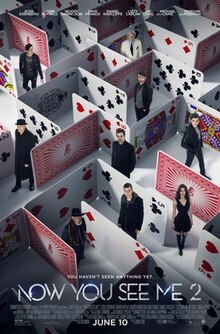 Even the movie’s title feels very lousy and unimaginative (what’s wrong with a title like Now You See Me: Now You Don’t?) By the end of the movie, everything is so ridiculous, not to mention that there is way too much going on, and the right things are never explained. The third act was too complicated and tiring and nothing important went explained. Also, a lot of the movie was way too predictable because of how cheesy and cliche a lot of the plot points were. This film brings the franchise on a completely wrong track, to the point where a third film just wouldn’t work. Now You See Me 2 is a disappointing and uninspired summer sequel with unfocused narrative and directing. There is just way too much going on for you to care, and nothing is explained well when explanation is needed. Most of the cast is not great, and the movie is lost within the wrong genre. If there’s a film you want to go watch on the big screen, you should not consider this one. This entry was posted in Action and tagged action, action movies, daniel radcliffe, dave franco, film, film reviews, films, heist movies, jesse eisenberg, lizzy caplan, mark ruffalo, movie, movie reviews, movies, now you see me, now you see me 2, woody harrelson. Bookmark the permalink.